I have an ever growing collection of selvedges. I love looking through them. 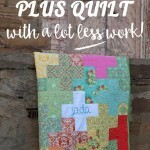 I can remember the quilt that each fabric was bought for, the bee blocks I made with it or maybe even the special shopping trip I was on to buy it! Can’t you tell I have serious fabric addiction issues? 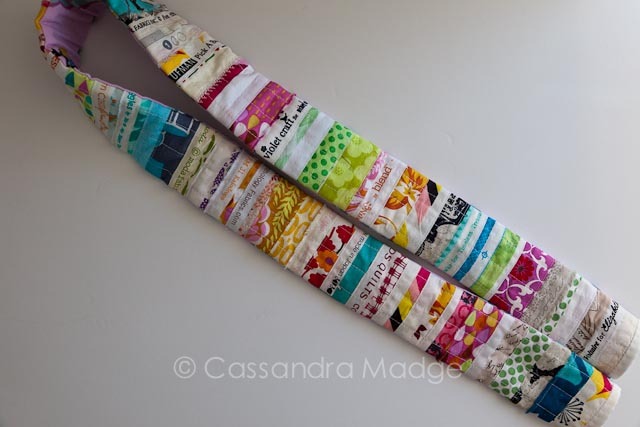 But, apart from collecting in jars on a shelf, what else could I use these colourful strips of fabric for? Firstly, though, what is a selvedge? Selvedges are the strongest part of the fabric, because they are the solidly woven edges of the bolt. Depending on the design and manufacturer they may have print right to the edge on one side, while the other side will carry the fabric designer name, the company who manufactured it, and those colourful spots that help identify all the ink colours that went into the design. Because of their strength and woven nature, they will not fray on the outside edge and only need to be secured by the cut edge. 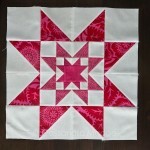 This made them idea for a version of quilt as you go, or qayg for short. 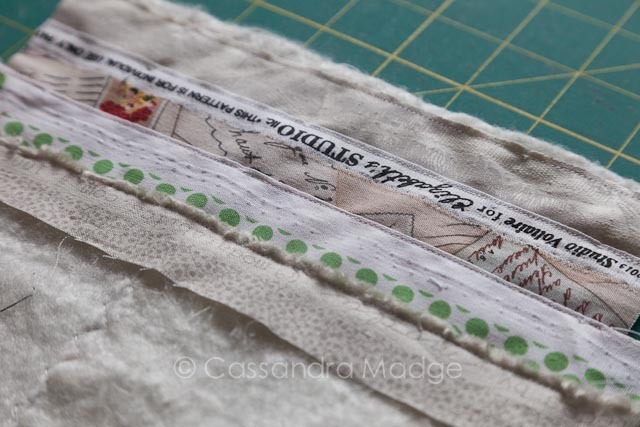 Using some scrap batting strips, I started at one end, laying down my selvedge pieces, always with the woven edge first. 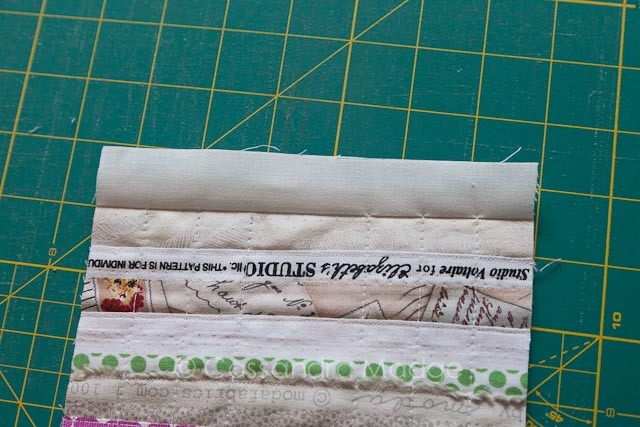 Overlap each strip by 1/4″, and simply lay the next one down on top. 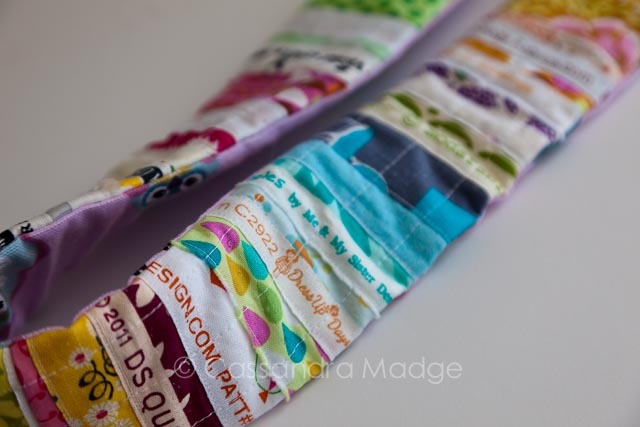 Once I got into the swing of it, I was able to pin and sew two or three strips at a time, saving a lot of going backwards and forwards to the machine. 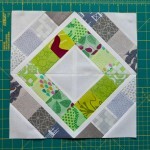 I used a slightly shorter than normal stitch length, about a 2 or just under on my vintage Bernina Record. 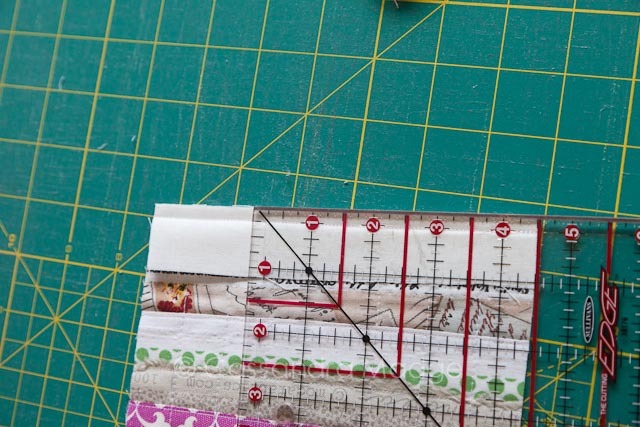 Sew carefully just inside the woven edge, making sure that you are overlapping and thus securing the cut edge of the strip below by the 1/4″. Keep working your way along until you have a long enough piece. 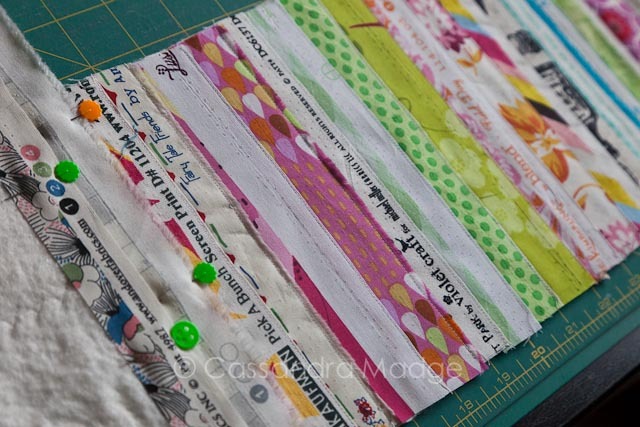 I used a modified binding type for the final edge…. 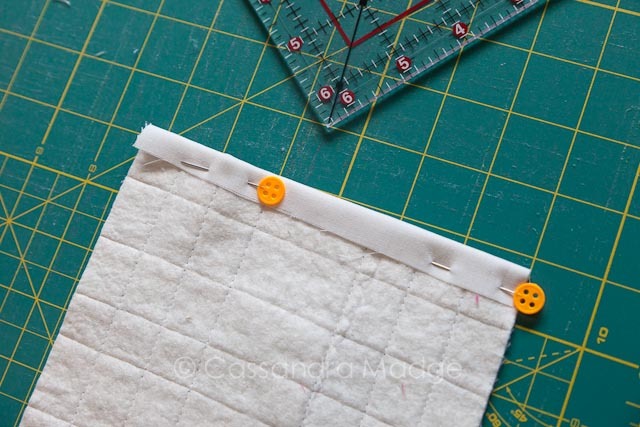 flipping my strip and sewing right sides together 1/4 over the last edge. 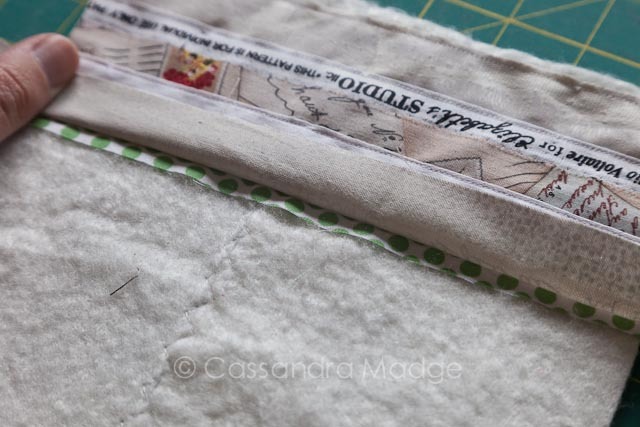 I then pressed and folded this piece back underneath the batting, and then secured the end by zigzag stitching. This covers the raw edge of the batting and secures the raw edges of the fabric all in one hit. I also ran some long vertical lines of stitching through my panel, as you can see in the picture above. 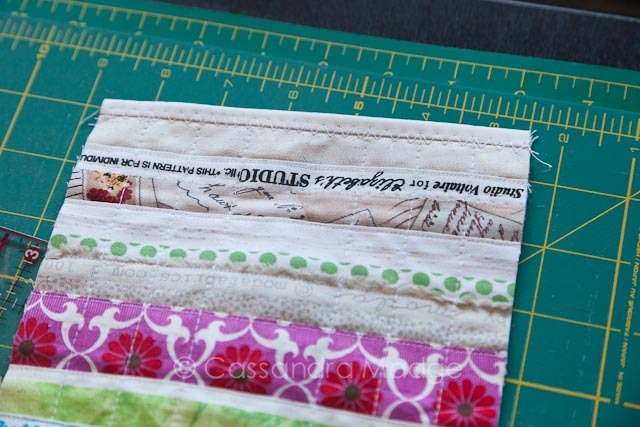 This was to continue to strengthen the layers and help them stop shift or distorting in the strap making process. 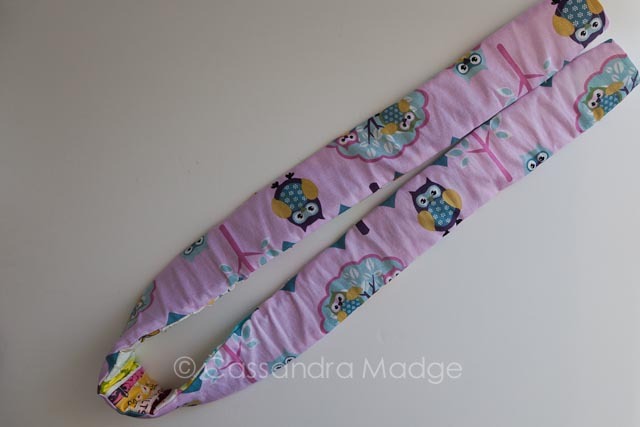 I used this long strip to make 2 straps – a cover for my camera strap by backing it with an adorable home decor weight owl print. This simply threads over my existing camera strap and adds some fun and padding to it. 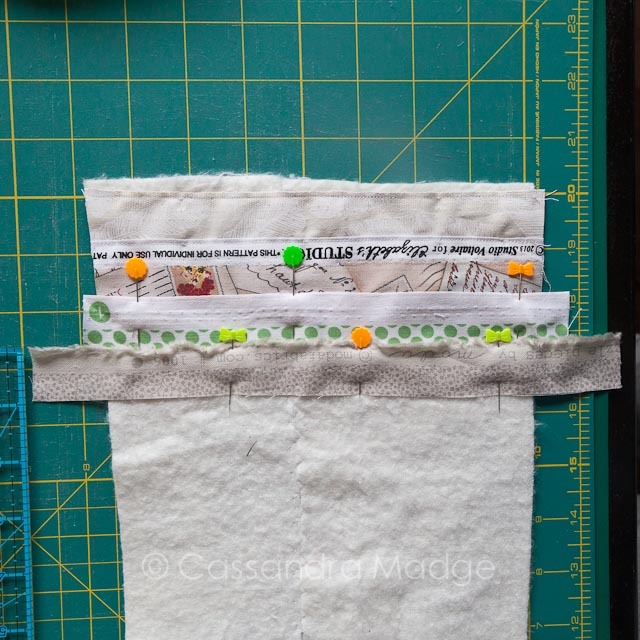 I also stitched through some swivel clips to make a fun strap for my new thrifted travel case! Because of the narrowness and the bulk, turning this strip tube inside out was extremely difficult, I ended up using a pair of miniature pliers to help pull it through. But it was definitely worth the strain! So now, whenever I go out and about, my accessories scream patchwork! 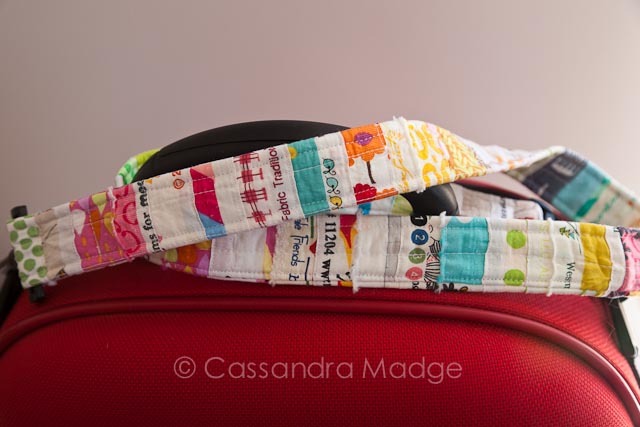 It’s all so fun and colourful and I loved carrying it with me through the airport. It held up well on my little interstate jaunt last week, I’m looking forward to using it more in the future! 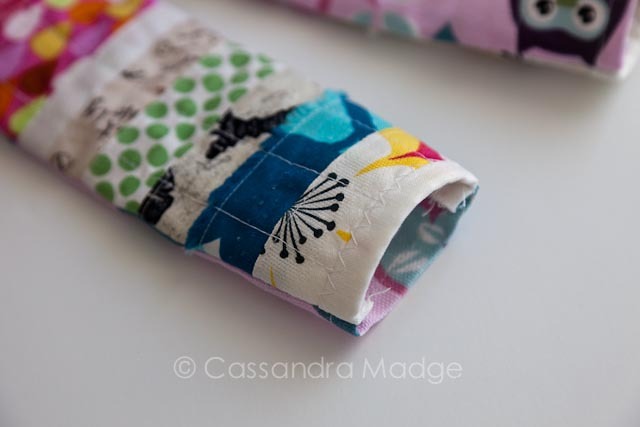 Do you keep your selvedges? 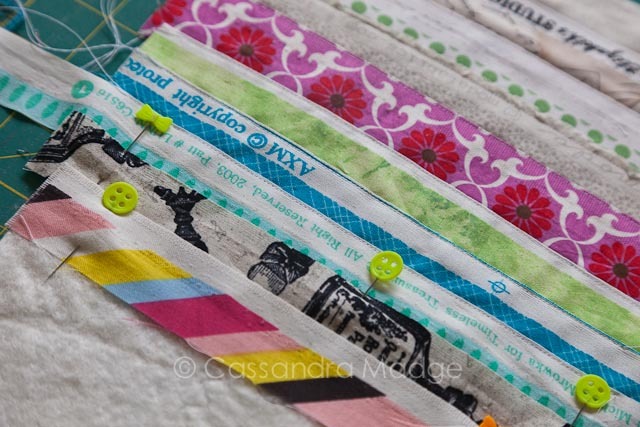 Have you used them for a fun project? Link us up in the comments and share your ideas! Thank you for these instructions. 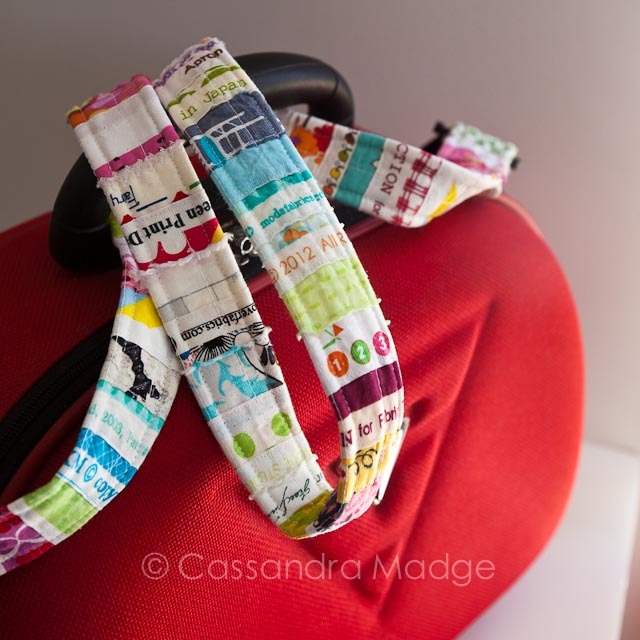 I have been saving my salvages for several years after seeing a purse made of salvages. I never used the selvages but kept them rolled up on large old wooden clothes pins in a small wicker basket. Now I have to try this to make an original camera strap. I’m glad that you found it inspirational Karen! If you make a camera strap, you will have to show it to me! !